Silver Horse Charm Jewelry: Winter’s Best Trend! 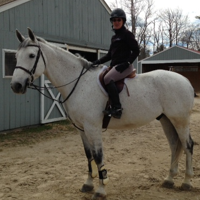 You are here: Home / Featured / Silver Horse Charm Jewelry: Winter’s Best Trend! This winter, we’ve been seeing two strong fashion trends continue: silver reigns supreme this season – great news for lovers of silver horse jewelry! – and charm bracelets are hot, hot, hot! What happens when you combine the two trends in one great piece of fine horse jewelry? 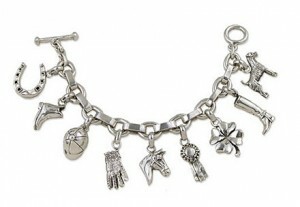 Check out The Ultimate Rider’s Charm Bracelet. This is one spectacular piece of silver horse jewelry. There are nine rider-themed charms dangling from this super chunky sterling silver toggle bracelet. Each charm is exquisitely detailed. There’s a horse shoe, a riding boot, a riding cap, a glove, a horse head, a blue ribbon (my favorite! ), a four leaf clover, a riding boot, and a dog charm – choose your favorite breed! This is a big look, perfect for the horse lover who enjoys dynamic, dramatic jewelry. Here’s a neat idea for all you fans of silver horse charm jewelry: each of the charms you see on this bracelet is available individually – they make fabulous pendants and great gifts! Silver horse charm bracelets can be very romantic. We love the soft, feminine look of this Lucky Celtic Horse Bracelet. 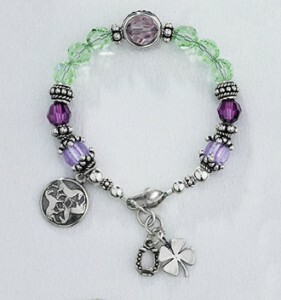 Faceted pale green, pale lavender and plum beads are paired with a silver celtic horse charm and a lucky four leaf clover charm. Add color and elegance to any outfit! Great for the bohemian spirit. There’s no denying that Pandora has driven the charm bracelet trend in a new and exciting direction. Bead style charms are incredibly popular. Finding the perfect bead charm to represent significant moments in your life has become a passion for many. Now there are Pandora Style Equestrian Themed Bead Charms available! These bead charms are compatible with Pandora or similar screw-type bracelets. They’re perfect for the horse lover: bead charms are available in horse head, riding boot, hay bales and more in both silver and gold!